In this intermediate class, students will build on the skills learned in Beginning Silversmithing. Students will make a sterling silver double half-round split shank ring with a bezel set cabochon stone (stones will vary from picture). 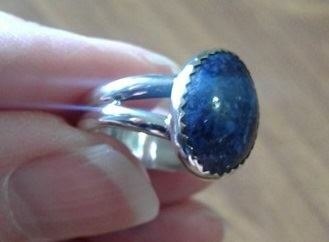 Students will learn metal forming, intermediate soldering techniques, stone setting and much more and complete this beautiful ring during this 2 hour class. All materials included in the cost of the class.